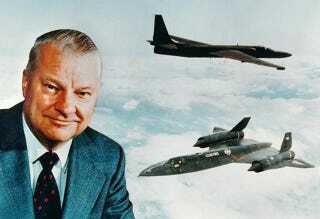 Clarence “Kelly” Johnson is the Babe Ruth of aerospace design. Aircraft programs under Johnson were so cutting edge and historically influential, and his cult of personality and management strategy so effective, that he and Lockheed’s Skunk Works (which he also founded) are forever enshrined in mankind’s technological hall of fame. The Lockheed Electra, P-38 Lightning, Constellation, P-80 Shooting Star, F-104 Starfighter, C-130 Hercules, U-2 Dragon Lady, Jetstar, and of course the almost supernatural A-12 Oxcart and its SR-71 Blackbird successor are just a few of the nearly 50 designs Johnson worked on during his 50 year career with Lockheed. 1. The Skunk Works manager must be delegated near complete control of his program in all aspects. He should report to a division president or higher. 10. The specifications applying to the hardware, including rationale for each point, must be agreed upon well in advance of contracting. 12. There must be mutual trust between the military project organization and the contractor, and there must be very close cooperation and liaison on a day-to-day basis. This cuts down misunderstanding and correspondence to an absolute minimum. 15. Never do business with the Navy! 16. No reports longer than 20 pages or meetings with more than 15 people. 17. If it looks ugly, it will fly the same. It is amazing to think that one man did so much to advance mankind’s aerospace capability. Even his few dead-ends and failures had key technologies that would lead to wins or lessons learned down the road. I marvel more and more at what enterprising engineers were able to do with slide rules and drafting tables so long ago. We have lost something in the aerospace engineering world, and I wish we has leaders like Kelly Johnson around so that we could somehow get it back.